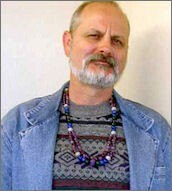 Jamey D. Allen has been involved in bead study for over thirty years. He is the author of numerous publications and books and was recently the co-chair of the seminar for the International Bead & Beadwork Conference in Istanbul. He is the Founding Member of the Bead Society of Northern California (1977), and Cofounder of The Society of Bead Researchers (1981), and has served as president of both groups; and is an honorary member of several bead societies throughout the world. Jamey is also consulting curator for The Bead Museum in Glendale, Arizona -- where he has mounted exhibits and composed catalogues for the past fifteen years. Having studied ancient glassworking techniques for nearly ten years, in 1987 Jamey embarked upon making beads from polymer modeling compounds (primarily Fimo), using ancient techniques, translated from glass to plastic. In many instances, he has made reproductions of bead styles that have not been produced for over 1,000 years. Jamey is moderator of four groups on Yahoo and a daily contributor to BeadCollector.net. Beads represent the oldest form of art. They were the first durable ornaments, coveted by mankind not only for their beauty, but also for their supposed magical and talismanic properties. Made of materials such as shell, bone, seed, wood, metal and glass beads, have been used as units of currency in many parts of the world.